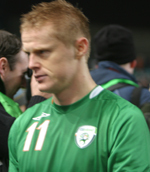 Damien Anthony Duff (born March 2, 1979 in Ballyboden, Dublin) is an Irish footballer. He currently plays as a winger for FA Premier League club Newcastle United and internationally for the Republic of Ireland. After his performances in the Champions League for Chelsea and World Cup 2002 for Ireland, Duff became one of the most feared wingers in Europe. With pace, accurate crossing and impressive finishing combined with his much improved versatility, such as an ability to play on the right-wing, as a second striker or at left-back as well as his natural position of left-midfield. However, he has spoken of his preference for the left-wing. Duff joined Blackburn Rovers as a trainee in 1996 after playing for Leicester Celtic, St. Kevin's Boys and Lourdes Celtic as a schoolboy in Dublin. He made his Blackburn debut at the age of 18 against Leicester City on the final day of the 1996-97 season. In his first full season (1997-98) he scored four goals and his exciting performances saw him billed as a big star of the future. Despite Blackburn's relegation the following season, Duff stayed loyal to the club and did not ask for a transfer, despite the obvious attention he was receiving from top flight clubs. Duff helped Rovers achieve promotion back to the Premiership in (2000-01) and then win the League Cup the following season. Following his excellent World Cup 2002, Duff was soon identified as a world-class player, and rumours were rife that Duff would move to a bigger club. However, Duff signed a new four-year contract with Rovers in summer 2002, stating his happiness with being at the club. Despite injury problems, his superb form continued in the 2002-03 season and he finished top goalscorer for Rovers with 11 goals. In the run-up to the 2003-04 season, buoyed by new owner Roman Abramovich's money, Chelsea made a series of bids for Duff, with a £17m offer eventually triggering a release clause in the player's contract. Duff took many days deciding whether to leave behind his comfortable lifestyle in the Ribble Valley and move to a big city club, but he finally decided to end his seven year stint at Rovers, looking to challenge himself at a higher level. Duff completed his move to West London in July (the transfer fee of £17m was at the time a club record), and there were high hopes for the Irishman. His first season at Chelsea was somewhat plagued by injury, and crucially he missed the latter stages of the season, including the Champions League semi-finals. Duff scored six goals that season with his goal against Newcastle in a 5-0 demolition particularly underlining his talent. Intercepting a throw from his international team-mate, Shay Given, he chipped the ball over the last man's leg and took a few touches before volleying the ball into the bottom corner of the net past his compatriot. Another individual effort came against Lazio in a 4-0 win at the Stadio Olimpico. Receiving the ball on the left wing, he dribbled past four defenders before slotting the ball in at the far post with his right foot. He was instrumental in securing for Chelsea the club's highest league finish for 49 years as well as the Champions League run, but the season ultimately ended trophyless and with the sacking of manager Claudio Ranieri. The arrival of Dutch winger Arjen Robben and new manager José Mourinho posed a threat to Duff's place in the starting line-up for the 2004-05 season, but an injury to Robben at the start of the season saw Duff as the only available winger. Mourinho, however, did not play Duff in the early part of the 2004-05 season, preferring a more narrow approach. Duff eventually got into the side after four games and, when Robben returned to the side, Duff's versatility saw him move to the right wing and form a ferocious wing partnership with Robben. The season proved to be successful for both Duff and Chelsea. He scored ten goals, including a crucial strike in a 4-2 win against Barcelona in the Champions League, while the team won the Premiership title and the Carling Cup (in which Duff scored what proved to be the winning goal in the semi-final against Manchester United). Duff proved to be a pivotal player for Chelsea in 2004-05 but the 2005-06 season was largely disappointing for him as he failed to recapture his form from the previous season. Duff was also left out of the side in favour of Robben and Joe Cole, and there was mounting transfer speculation regarding his future at Chelsea. In the summer of 2006, clubs such as Liverpool, Spurs and Newcastle were reported to be interested in signing him. On July 22, 2006, Duff agreed terms over a £5m move to Newcastle United and officially completed his transfer on July 23, signing a 5 year contract. Duff was believed to have been considering an offer from Newcastle, before Liverpool made a late bid to sign him. Duff claimed it was the fans, the city and the club itself that attracted him to sign for Newcastle. His first game was a start in a friendly home game against Dutch side PSV Eindhoven on the 29 July 2006. Duff made his competitive debut in a UEFA Cup Second Round Qualifying first leg against Latvian side FK Ventspils. On Sunday 17 September 2006, he scored his first goal for Newcastle. It was the first goal in a 2-0 victory over West Ham away at Upton Park. Despite occasional impressive pieces of play, Duff failed to live up to the promise shown at Chelsea and Blackburn for much of his first season at Newcastle. Duff suffered a knee injury in November that kept him out for four months, during which Newcastle had a bad run of defeats. He returned but has been ruled out for the rest of the season due to an ankle injury in a 2-1 loss to Portsmouth on Saturday 14 April 2007. At junior level, Duff played for Ireland in the 1997 and 1999 FIFA World Youth Championship. Last 10 games in which Damien Duff scored. Games in which Damien Duff was a Substitute.